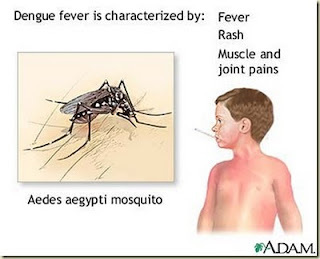 Dengue [DEN-ghee] is a flu-like viral disease spread by the bite of infected mosquitoes. 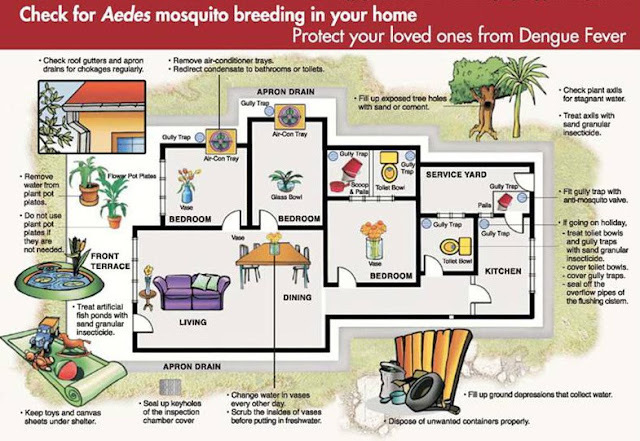 Dengue hemorrhagic fever is a severe, often fatal, complication of dengue. Dengue viruses occur in most tropical areas of the world. 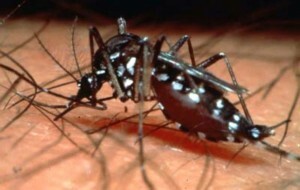 Dengue is common in Africa, Asia(Pakistan,Sri Lanka,India) and the Pacific, Australia, and the Americas. It is widespread in the Caribbean basin. 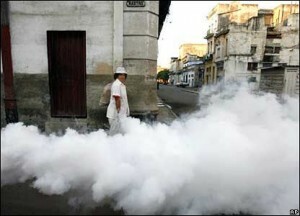 Dengue is most common in cities but can be found in rural areas. It is rarely found in mountainous areas above 4,000 feet. 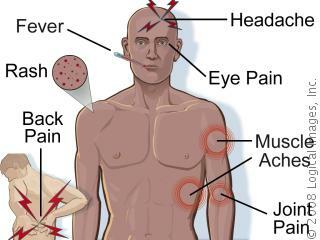 Dengue fever usually starts suddenly with a high fever, rash, severe headache, pain behind the eyes, and muscle and joint pain. 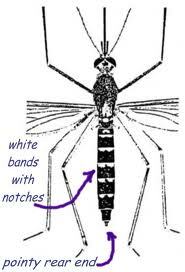 The severity of the joint pain has given dengue the name "break bone fever." Nausea, vomiting, and loss of appetite are common. A rash usually appears 3 to 4 days after the start of the fever. The illness can last up to 10 days, but complete recovery can take as long as a month. Older children and adults are usually sicker than young children. 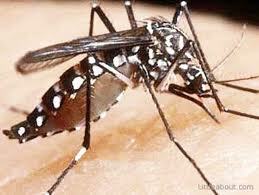 Dengue fever may be diagnosed by microbiological laboratory testing. This can be done by virus isolation in cell cultures, nucleic acid detection by PCR, viral antigen detection or specific antibodies (serology). 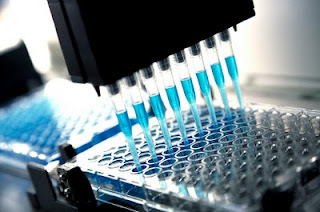 Virus isolation and nucleic acid detection are more accurate than antigen detection, but these tests are not widely available due to their greater cost. All tests may be negative in the early stages of the disease. These laboratory tests are only of diagnostic value during the acute phase of the illness with the exception of serology. Tests for dengue virus-specific antibodies, types IgG and IgM, can be useful in confirming a diagnosis in the later stages of the infection. Both IgG and IgM are produced after 5�7 days. The highest levels (titres) of IgM are detected following a primary infection, but IgM is also produced in secondary and tertiary infections. The IgM becomes undetectable 30�90 days after a primary infection, but earlier following re-infections. IgG, by contrast, remains detectable for over 60 years and, in the absence of symptoms, is a useful indicator of past infection. After a primary infection the IgG reaches peak levels in the blood after 14�21 days. In subsequent re-infections, levels peak earlier and the titres are usually higher. Both IgG and IgM provide protective immunity to the infecting serotype of the virus. In the laboratory test the IgG and the IgM antibodies can cross-react with other flaviviruses, such as yellow fever virus, which can make the interpretation of the serology difficult. The detection of IgG alone is not considered diagnostic unless blood samples are collected 14 days apart and a greater than fourfold increase in levels of specific IgG is detected. In a person with symptoms, the detection of IgM is considered diagnostic. When indoors, stay in air-conditioned or screened areas. Use bed nets if sleeping areas are not screened or air-conditioned. 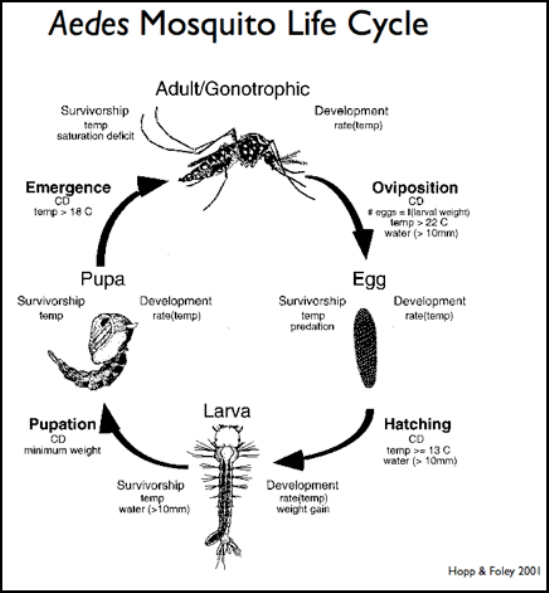 Dengue Dengue fever Dengue hemorrhagic fever complication of dengue fever mosquito breeding sites .